Josh has always dreamed of becoming an artist. His best friend, a calico cat named Hope, keeps him company as he draws. He relies on her support, since the adults in his life don’t understand his passion. But one tragic day he loses Hope, and almost loses his dream. Despite losing Hope, Josh keeps trying, and one day he finally succeeds. And just as he thinks he’s created his greatest masterpiece, he realizes Hope never really left him, and she will be with him forever. Anyone who has ever loved and lost a special pet will relate to Josh’s feelings at losing Hope. And any child or adult with a dream for the future understands how easy it is to let setbacks and criticism deter us from succeeding. In this oversize book with vivid and dramatic illustrations, the authors immerse us in Josh’s world and give us the opportunity to share in his dreams and accomplishments. 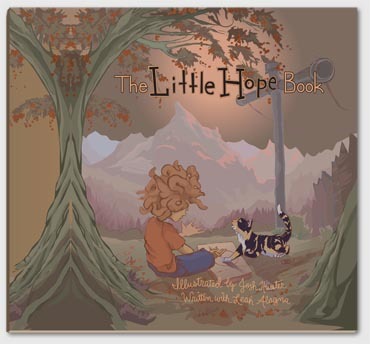 The Little Hope Book reminds kids that it’s important to dream big, and to believe in their dreams. If they believe, they can achieve wonderful things. Dream ~ Believe ~ Hope. You can do it!